The Knife Edge Trail, located outside the Morefield campground, is a 2 mile out-and-back trail that coasts above the Montezuma valley. The Knife Edge Trail, located outside the Morefield campground, is a 2 mile out-and-back trail that coasts above the Montezuma valley. The trail was built along the original entrance road into the park and is now open for hikers to walk down, enjoy the vista, and learn about the ecology of the Mesa Verde. The trail begins as a gravel path, wide and flat enough for a heavy-duty baby stroller. It meanders amidst gambel oaks and pinyon pines, and passes between two high rock features to the left and right. At the end of this short aisle, the trail turns left and follows the north rim of Mesa Verde for an additional .8 mile. And this is where it gets beautiful. Immediately the view becomes massive and magical; the trail overlooks a valley and offers opportunities to snap a photo of a formation of Point Lookout Sandstone. The Abajo Mountains and San Miguel Mountains are visible, and if it’s a clear day, the La Sals will be visible in the distance. The Knife Edge Trail is named after the Knife Edge Road, which was built in 1914 as an entrance to the park. The original road was narrow and appeared to hang on the sheer bluff; remnants of asphalt are still present today. Though the old road is gone, the “knife edge” notion remains, as the trail sits on the side of a bluff. Along the walk, small wooden posts are labeled from 1-32. These numbers correspond to a booklet, which details the flora and fauna of the area and is available at the beginning of the hike for a suggested donation of 50 cents. The end of the hike is only 62 feet higher in elevation than the beginning, and yet the difference is night and day. From here, Sleeping Ute Mountain is visible and has the profile of a person laying down for a nap. Take a picture, take a deep breath, and then—if you are inspired—you can also take a nap before making the 1 mile hike back to the trailhead as you watch the sunset. The trail may be short, but as soon as you get to the “knife-edge” section, you will be able to see for miles and miles. The hike is scenic and provides many moments to stop and snap a photo, but you will have to watch your footing while trying to take it all in. 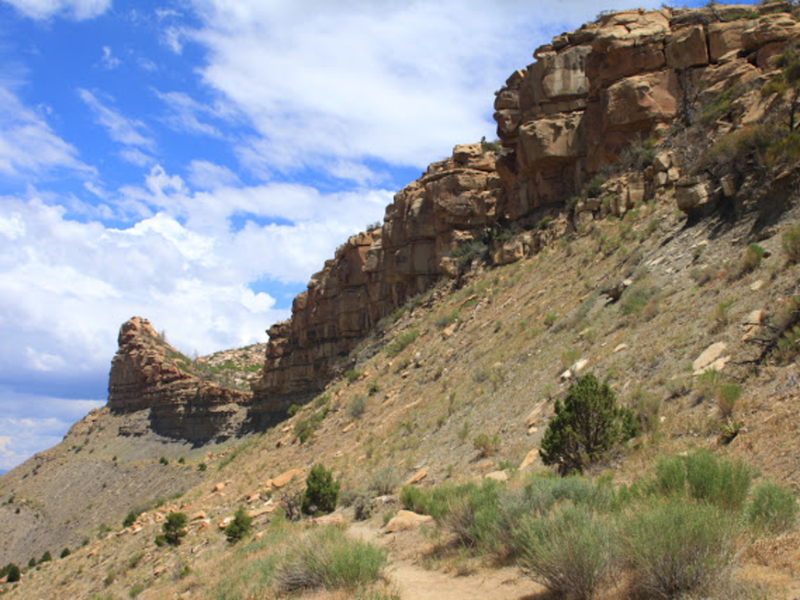 The Knife Edge Trail is a great choice for the young naturalist interested in learning about the ecology of Mesa Verde, or the hiker looking for a short route to catch a gorgeous sunset, or the family looking to find a scenic trail with a great picnic spot. 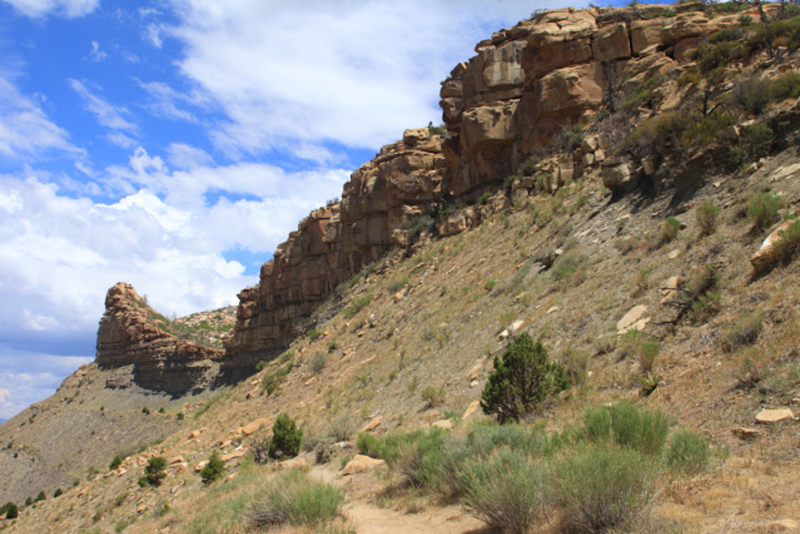 The Knife Edge Trail is located in the northwest corner of Morefield Campground inside of Mesa Verde National Park. There is a parking lot and a kiosk. No pets are allowed, and it is asked that hikers not leave the trail and be back by sunset.